A study in text, photographs and graphic design of the fiddler Ben Lennon of Kiltyclogher, Co. Leitrim. Ben Lennon is known widely as a stylistic performer and teacher in the national and international world of Irish Traditional music. 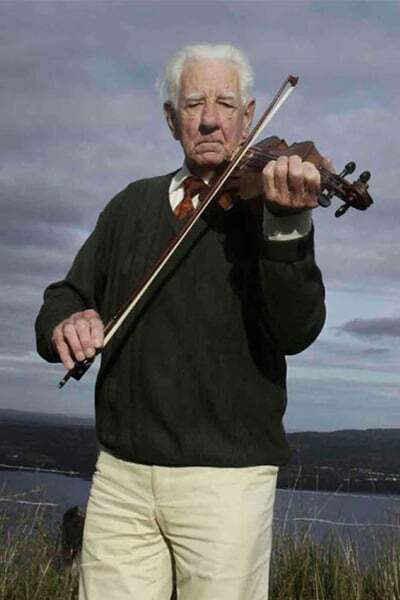 He began playing the fiddle at the age of ten, growing up in an atmosphere of home, céilí-house music-making and served his time with his father as a tailor. He developed his skills in post-World War 11 London among superb artisans and there immersed himself in a cosmopolitan city lifestyle. Back on Irish soil he returned to traditional music in its headiest revival years, first in Limerick and then Cork, while also engaged as an innovator and organiser in major clothing businesses. He returned north to Leitrim after twenty five years and relocated himself in local music, going on to teach his instrument, and to record and broadcast. Ben Lennon’s life is documented here in words by Fintan Vallely. The fiddler is also presented within his music society in a hundred and more striking photographs by Nutan Jacques Piraprez. These elements are integrated by a vigorous, complementary design by Martin Gaffney as the visual story of a personal journey in music by a commentator who has a bird’s eye view that is a panorama of the technological and artistic transformation from the old Ireland to the new, from traditional music redundancy to its artistic supremacy. Launched at the Willie Clancy Summer School, Miltown Malbay on Sunday, 3rd July, 2011.